If success is rewarded by hunger and hard work then it will come as no surprise that Harry Shotta is now recognized as one of the most gifted and versatile MC's in the UK. An invitation from life long friend MC Funsta to join him on the Drum N Bass stage at the Notting Hill Carnival led to a whole batch of DNB P.A's and radio appearances. As an MC who has paid his dues in the world of Hip Hop, Harry Shotta had been working on tracks with the multi award winning Skibadee, one of which became the'1xtra record of the week'. With his skills in double time flows it was a natural progression to flex these skills in the Drum N Bass arena. The rapid rise of Harry Shotta in the Drum N Bass scene saw him being nominated as best breakthrough MC at the National DNB Awards in the space of three months. 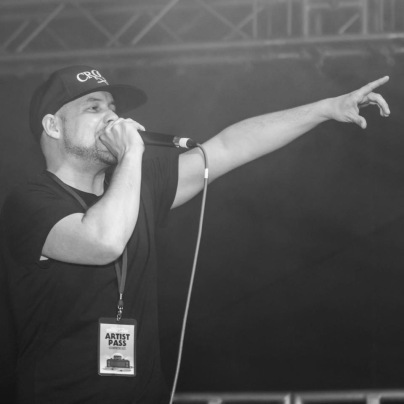 Having already smashed up raves such as Innovation In The Sun, Lets Go Crazy (Under 18s), One Nation and West Fest, Harry Shotta has also appeared on Kool FM, Cyndicut and Pyro. One stand out show was the full UNCZ line up on Kool FM back to back with Dizzee Rascal and D Double E.
Skibadee, Funsta, Harry Shotta and Ruffstuff have also joined forces under the 'UNCZ banner where they are already in demand for their exciting and passionate live performances. The debut studio mix from KG and Harry Shotta has resulted in over 100,000 downloads. This was followed by the Zen mix which also featured Skibadee & Funsta, Bar Rage 2 and more recently Hurricane Season Volume 1 and UNCZ In The Coffee Shop. 2009 was a good year with Harry Shotta scooping two prestigious awards. Best Breakthrough MC at The National Drum N Bass Awards held at the Custard Factory, Birmingham. Best Newcomer MC at The Drum N Bass Arena Awards, Ministry Of Sound, London. At the 2010 DNB Awards Shotta gained the massive accaolade of coming second place in the coveted Best Lyrical MC Category. Maximizing the social networking sites, has resulted in him maxing out two facebook pages and hitting over a million views on his Harry ShotShot You Tube Channel.